My last post was VERBOSE. 900+ words. Highly unusual. As penance, I will rely mainly on photos for this post. Also, I have the August lazies. And I am growing weary of the sound of my own voice. But I’m still having fun taking pics so I’ll stick with that. 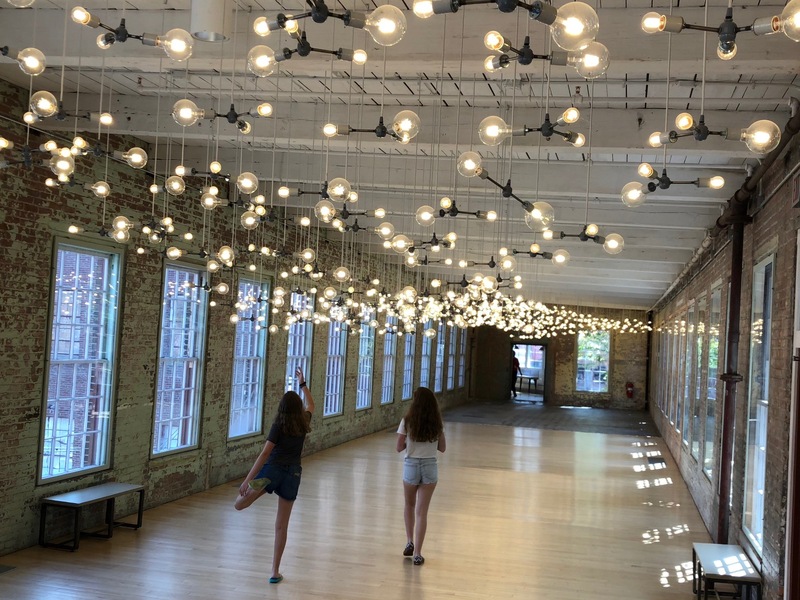 I packed-up the fam and hauled them to the Massachusetts Museum of Contemporary Art in western Mass. I had to drag the daughters. One insinuated it was a selfish act. That it’s something only I was interested in. Nice. The museum is a group of old, repurposed warehouses and factories. The vast spaces allow for big-piece installations. It’s exhausting. But not in the way a teenager is exhausting. This is more exhilarating. Seen here is a small sampling of what’s on display. It’s a two-day visit, easy. I include the daughters for scale. 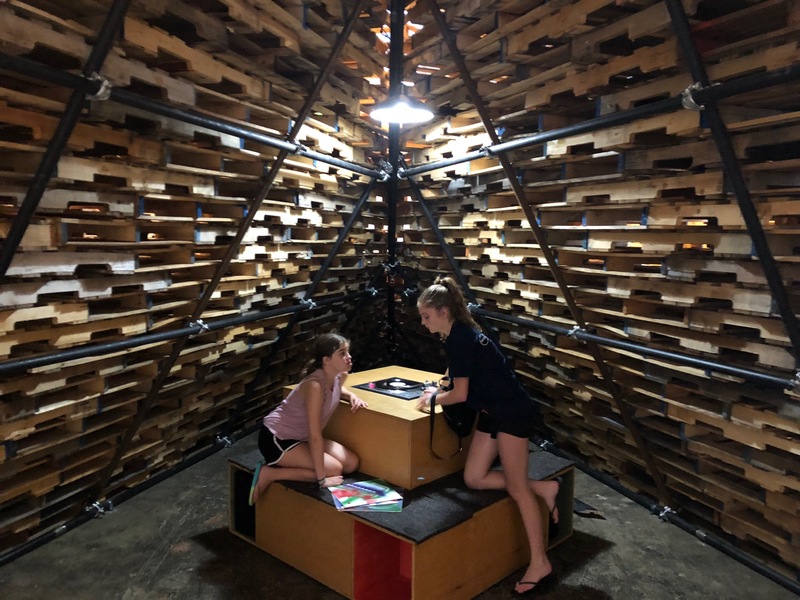 Liz Glynn’s three caves are constructed from shipping pallets. Inside each is a different sensation; touch, smell and sound. One had hanging strips of black, thick felt. One contained bottles with different fragrances. This was sound. A turntable with albums. 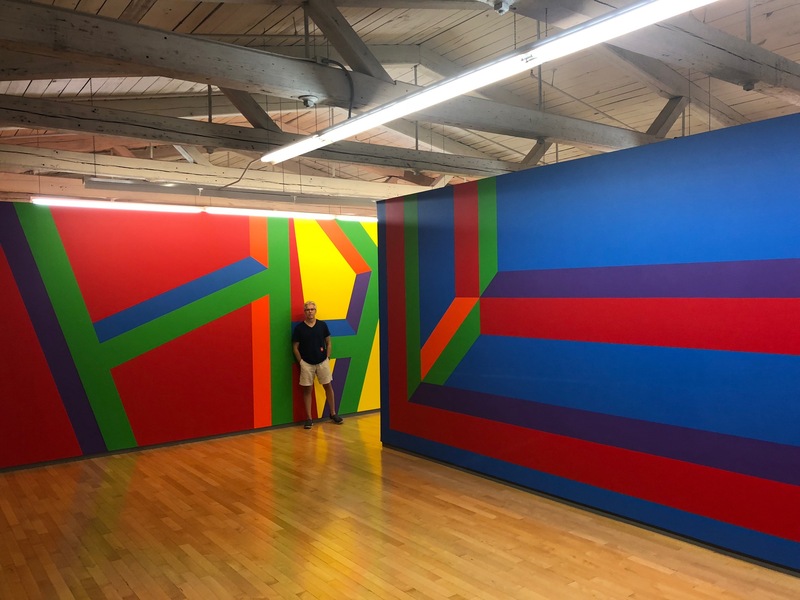 There’s a huge Sol LeWitt retrospective. I’ve been indifferent about his work over the years but I found this very satisfying. The exhibit occupies a historic mill. I’m like a parrot. I like bright colors and shiny objects. 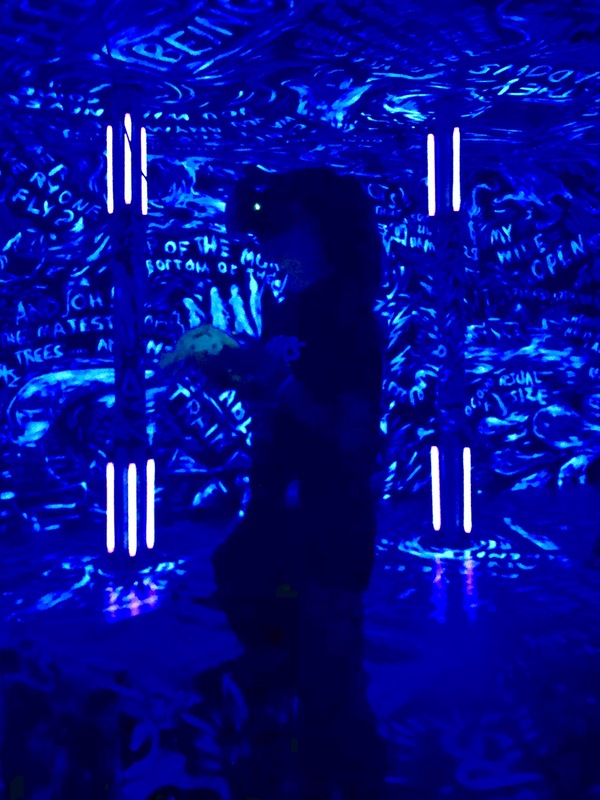 There’s a fantastic virtual reality piece by Laurie Anderson. It takes a few minutes to acclimate yourself with the controls and the goings-on but once mastered it really takes you to a different consciousness. 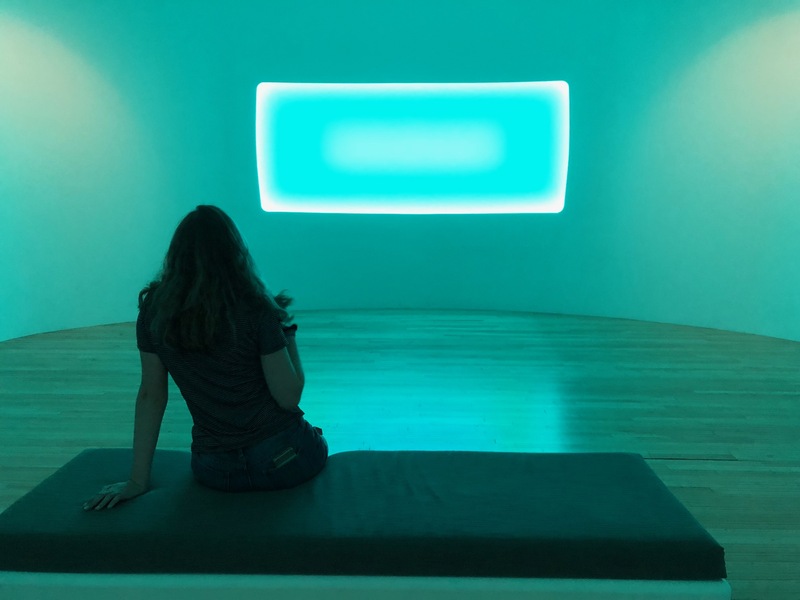 James Turrell is one of my favorites. Right up there with Rothko and Vinny van G and the rest. His medium is light. Here are two of the nine installations on display. Jenny Holzer’s Ribs. It’s kind of like a news zipper. Spender Finch’s Cosmic Latte was designed specifically for this space. After Mass we visited a county fair outside of Cleveland. It’s a genu-wine slice of rural life. Just look at these two sleeping angels. Adorable. Too bad for them they’re delicious in over a dozen different recipes. I don’t know what this creature is. My friend Carolyn said she thinks she saw it in a David Cronenberg movie and I think that’s possible. I wouldn’t eat it, that’s for sure. This bad boy won a second-place ribbon. Was the competition for most hideous cancerous growth? There was some racist memorabilia in the 4-H pavilion. What if you’re a little kid and you see this? Wouldn’t it stay with you for a long time? 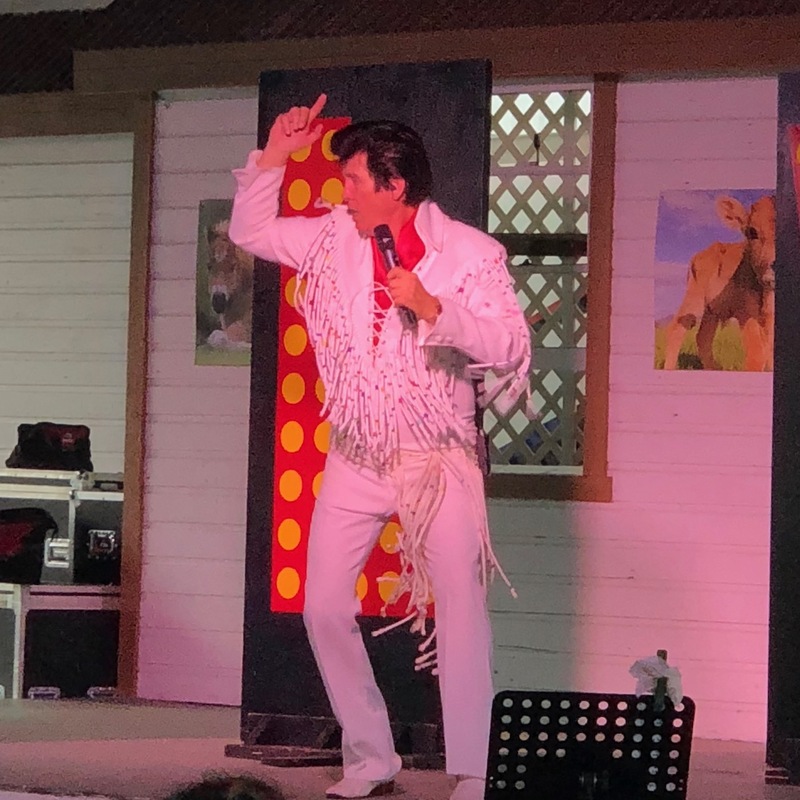 The King at the county fair in the heat of summer. If this won’t put a smile on your puss, nothing will. Thangkewverrmuch. 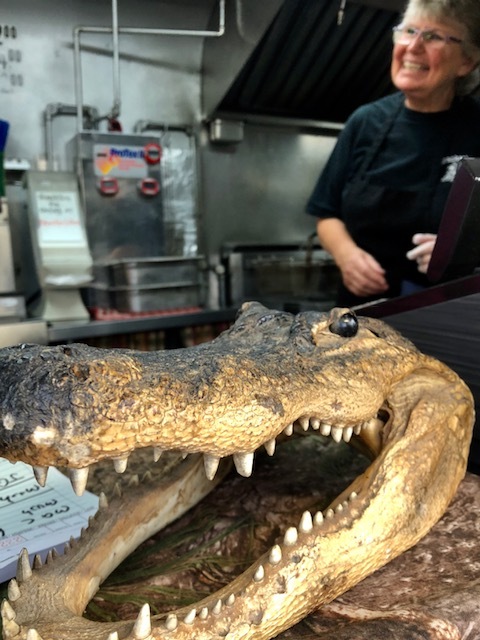 Meet the fried gator lady. She’s super-friendly with the same grin as that beheaded gator. I love fried gator. I wish had the wherewithal to make a gif of fire coming out of his mouth. I think the girls’ attitude turned way more positive when you arrived at the art itself, Mark. Great job sharing the enormity of it all. Thanks! Someone assured me that the girls would appreciate it when they were older, although they couldn’t specify a specific age. I find the theory highly suspect. They’ll groan, “Our dad used to drag us to art shows,” but they’ll say it with a sort of pride because they’ll know there are so many dads who wouldn’t bother. That’s not why I do it but I sure hope that’s a happy byproduct. We’ll be away during our local fair, which is always a good time. When our older kids were younger, they would enter crafts and drawings in the many arcane categories (best pasta art, modgepodge, Lego construction…). These were done usually the day before entries were due. It was madness, but they earned ribbons and cash! And they’d have to go to the fair every day! Now they don’t drag us there anymore, speaking of dragging. Was there a missed opportunity to make an awesome fort out of those shipping pallets? I hope not. Not too late, maybe. The shipping palates WERE a fort! Three of them. They were pretty badass. Couldn’t climb on them, tho. The security guards had no sense of humor. … ation is amazing. I would like to see that one. Your kids WILL appreciate later. 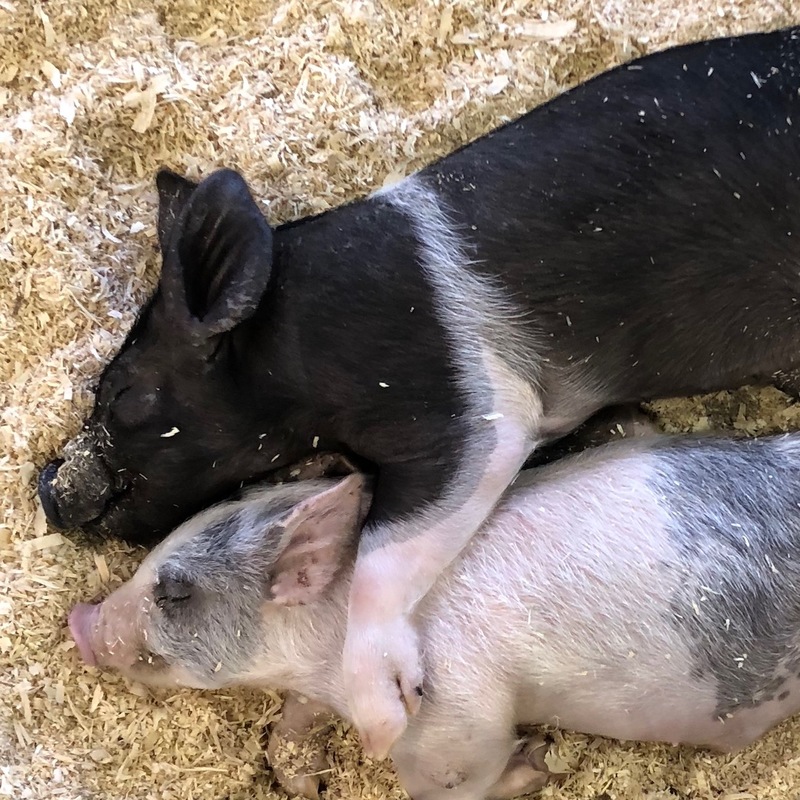 And the piglets – I can’t look at them and think “lunchtime!” I would make a terrible farmer. There were a few other Tyrrell light pieces that didn’t photograph well that killed. I wanted to revisit them before leaving the museum. The colors, hues and brightness are in constant flux. They change. But everyone else wanted to leave. Next time, I go ALONE. …and, I’m sorry. But those animals agree with my palate. It’s a good thing bacon doesn’t actually look like one of those or I couldn’t do it. One reason I can’t eat a lobster is because it looks like a lobster! Thankfully, a hamburger looks nothing at all like a cow. i’m a fan of interactive, large scale art. when it surrounds you, and responds to you, how can you NOT have a deeply personal experience! thanks for the pretty pictures! You need a lot of space to pull this stuff off and these buildings are perfect. There are about six of them (buildings) and each one has something fetching inside. Western Mass near the NY/VT border. If you’re ever nearby, it’s WORTH the trip. How are things in Turkey? Everyone okay? Thinking of bailing out yet? Despite the fiscal chaos, all is steady there. She’s not leaving – in fact, she and her husband are adding a third to the party! i’ll be going over for the month of December to welcome another grandcritter! Holy smokes! Congrats! Are you going over alone? That’s exciting. Will the new grandcritter be an automatic American citizen? How does that work? We can buy crocodile meat here.Well, those of us with fat wallets can! At around $30 per kilo it’s too rich for me! Not a Naked Neck?! Are you kidding me?! Honestly I wasn’t 100% certain it was a rooster. Can those ugly overgrown combs be trimmed? Are they supposed to be? 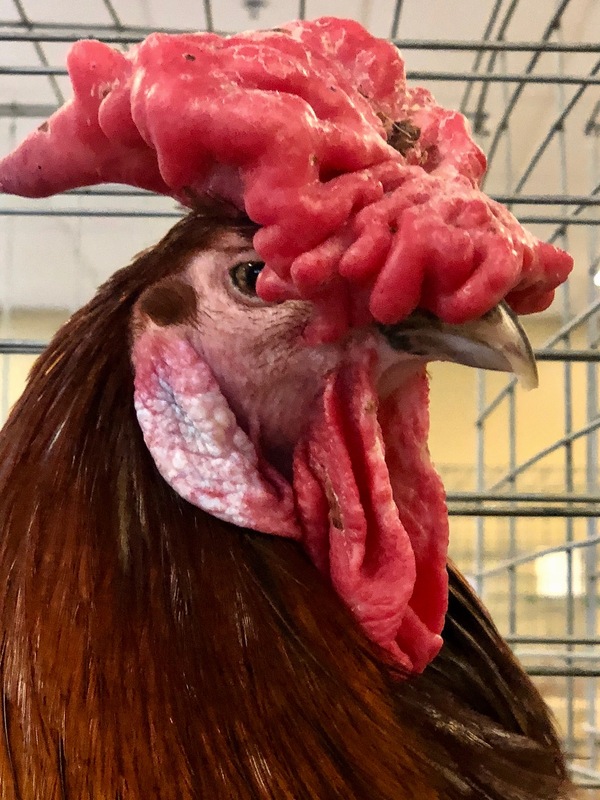 And how do you know do much about roosters?! This was alligator meat. Supposedly. I wonder if that’s different than crocodile meat? I’d like to find out. The one with the badly clipped beak may be hen or rooster-can’t tell here. I had about 40 hens and some roosters.Just for household eggs;I was not into breeding, though i did have to get rid of some when they multiplied more than I wanted! That’s fascinating. What else am I unaware of, I wonder? I only ever knew rooster combs through the picture on the box of Corn Flakes. In real life, they’re kind of disgusting looking. What a wonderful use of pallets. This could be the future of urban residence. 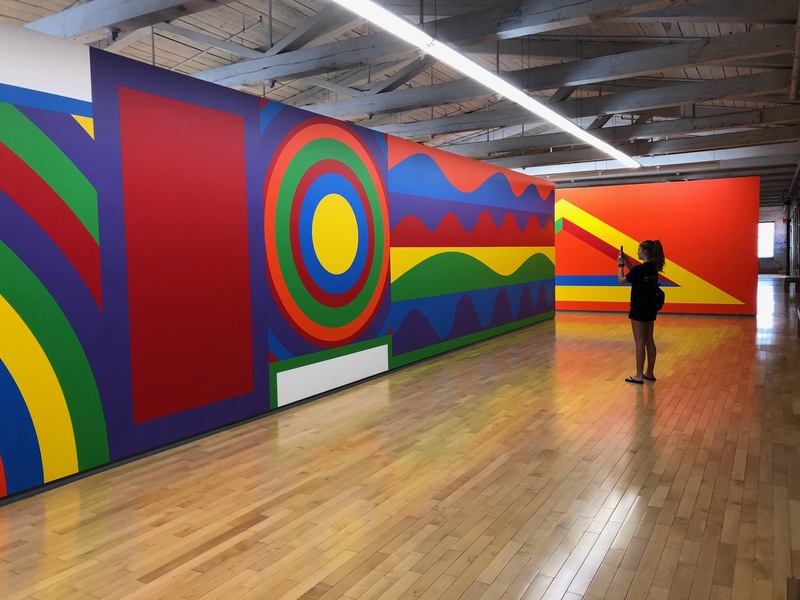 There’s something primal and childish about the Sol LeWitt that makes me like it even though I don’t really. 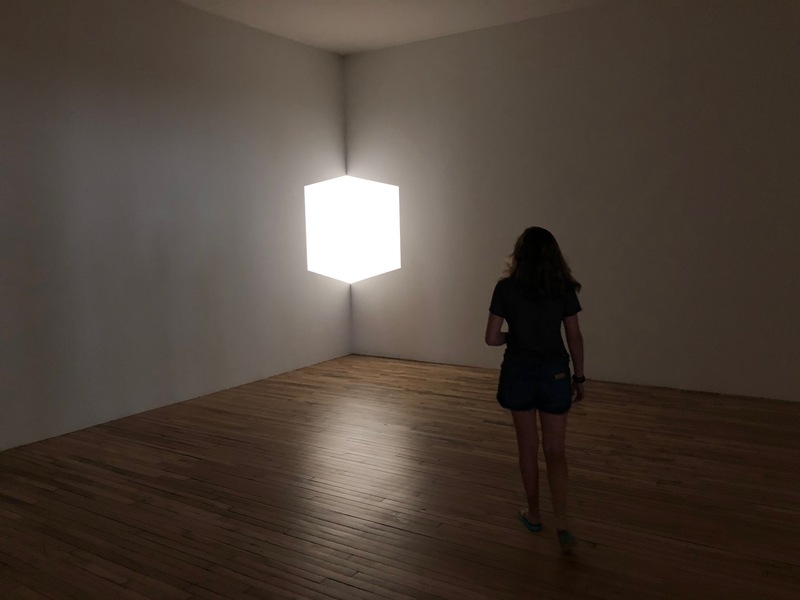 James Turrell has it going on whatever “it” is. Ewww… do NOT like that chickens hat. 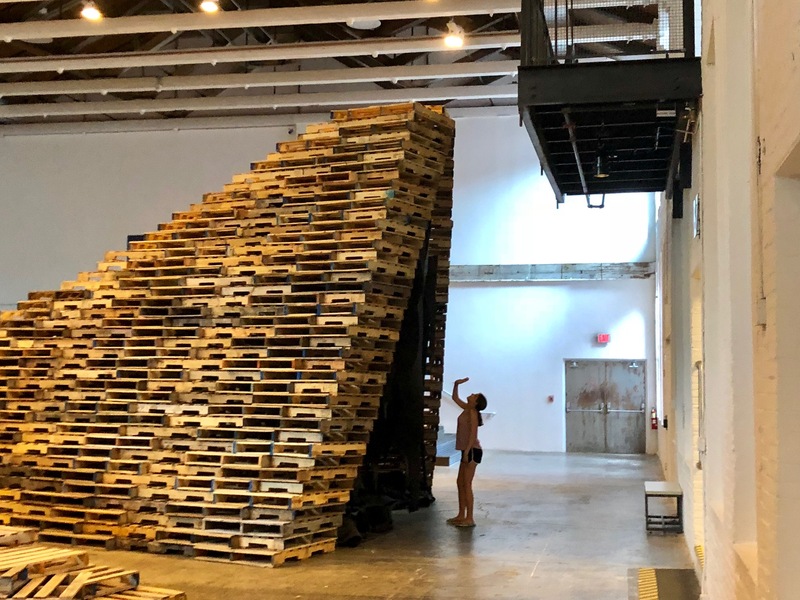 I wonder what’s going to happen to those pallets at the end of the exhibit? Maybe they’ll sell them at an auction at Christie’s for millions of $$$. Ha. I’m not crazy about most of LeWitt’s stuff. I think it’s kind of boring. But these pleased me. Turrell had a show at the Guggenheim years ago that was the best thing I’ve ever seen there. These were pretty good, too. 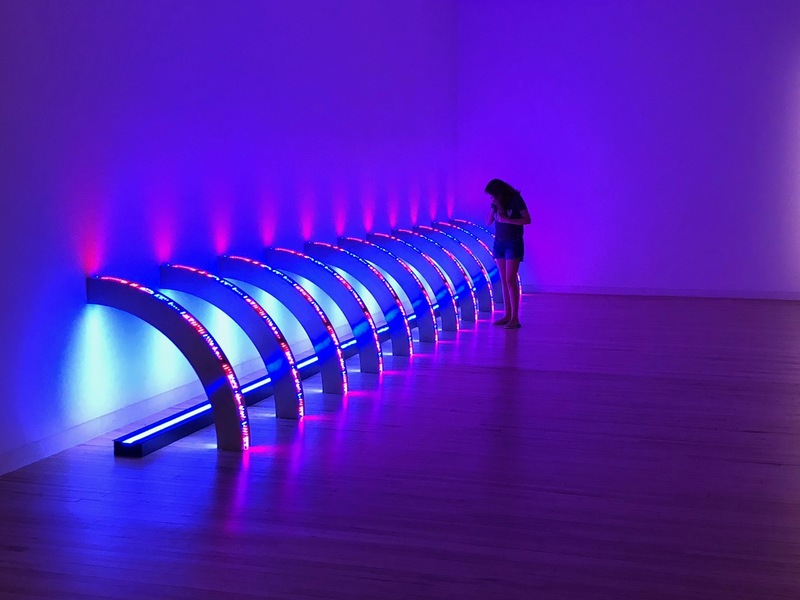 My kids went to the Phoenix Art museum recently, dragging a friend of theirs along because they were shocked to find she’d never been there. Appalled, actually. I was rather proud of that. That’s a nice art museum! I’ve been there. If you live in the general vicinity you really owe it to yourself to visit once in a while. You put sausage gravy on top of pork? That is genius! Evil genius! Like, James Bond villain genius. Now, I must go. For you have made me hungry. He doesn’t do homes but he did create a crater in northern Arizona. Do you know how to do that?! Add flames, I mean. Not start enjoying my voice again. Sounds like some black magick, adding gif flames…knowledge I don’t want or need. Have you ever seen a Kusama exhibit? She uses boxes and lights and I drug my kids to one in Houston a few years back and it was way cool! Also, I raise chickens and that comb on that rooster is yucko. You can get birds that will specifically have a comb like that, but I prefer a cute little trim comb. I have seen hey stuff and you’re right! She’s way cool! She’s VERY popular now. People wait in line for hours just to peek. Here’s a post from about five years ago with some great pics of my daughters in one of her infinity rooms. I learn stuff on this blog. Until this post, I didn’t know that was called a comb. How would I know?! We saw that polka dotted stalactite-type Kusama room as well! And an infinity room box. Way cool! 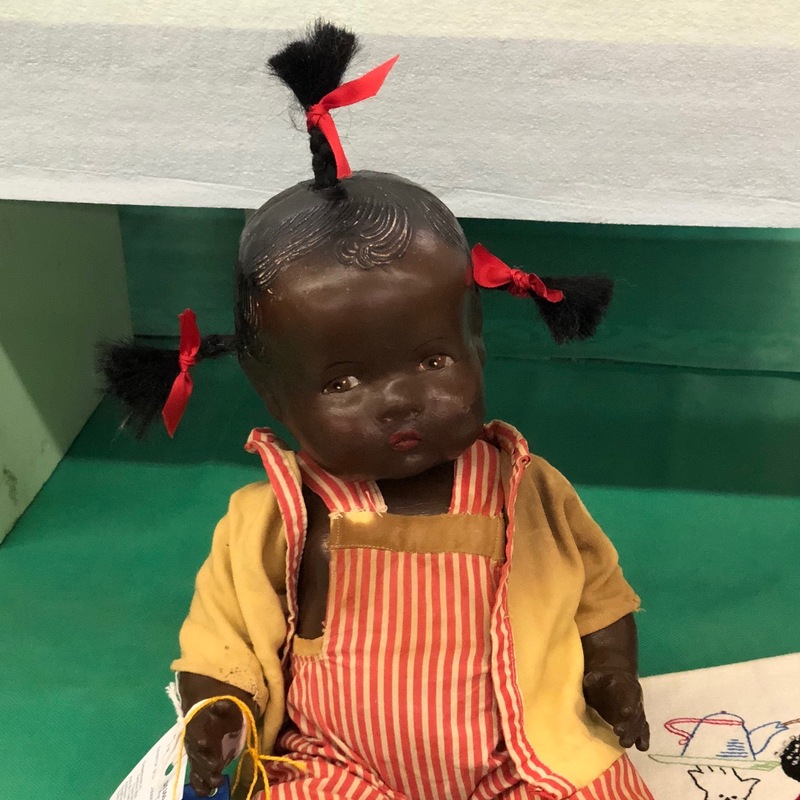 I’m old…when I was 4, Dad brought me an African-American doll (cloth, wearing a gingham dress, with braided black hair) from New Orleans. I named her “Maudie,” in honor of our housekeeper. She was my favorite; took tea with the other dolls; slept in my bed; and I kept her for my own two girls. Couldn’t/Wouldn’t do that now…but I do think it’s important to remember context. That’s an interesting story. I wonder how it formed your feelings/opinions into your childhood? It’s an interesting dichotomy between something done long ago with good intentions that might be discouraged today. Thanks for the Art pics. Big Art paintings are awesome. That’s a long haul from Western Mass to the Cleveland Area. Did you do it in the same vacation time? Did you stop in Pennsylvania for any Art sightings? How about Hershey PA or Gettysburg? Regarding the dolls, I’ve seen those hair styles on some popular black celebrities recently. That’s what makes racism so confusing. I was also in Cleveland 2 weeks ago. What were you doing in Cleveland?! It’s not everyone that goes there. The drive was about eight hours. We stayed overnight in Western Mass and continued home to New Jersey the next morning. The drive was about eight hours. My daughter protested the side trip to the museum. She just wanted to get home to her boyfriend. But since I own the car, pay for the gas and drive, we went and saw some art. What were you doing in Cleveland?! It’s not everyone that goes there. We never stop in Pennsylvania on these road trips from New Jersey to Ohio. I would like to stop in Pittsburgh one day to see the Warhol Museum. I hear it’s worth the time. We’ve done Hershey on separate trips. I’ve seen enough of that place. I’ve never been to Gettysburg and, at this point, have no plans. I remember black dolls! Obviously at some point they were taken away from me, I cried. Love Sol Le Witt, he makes me smile. Your ma and da gave you black dolls when your were little? That’s unusual. Very progressive of them. I wonder why they took them away. 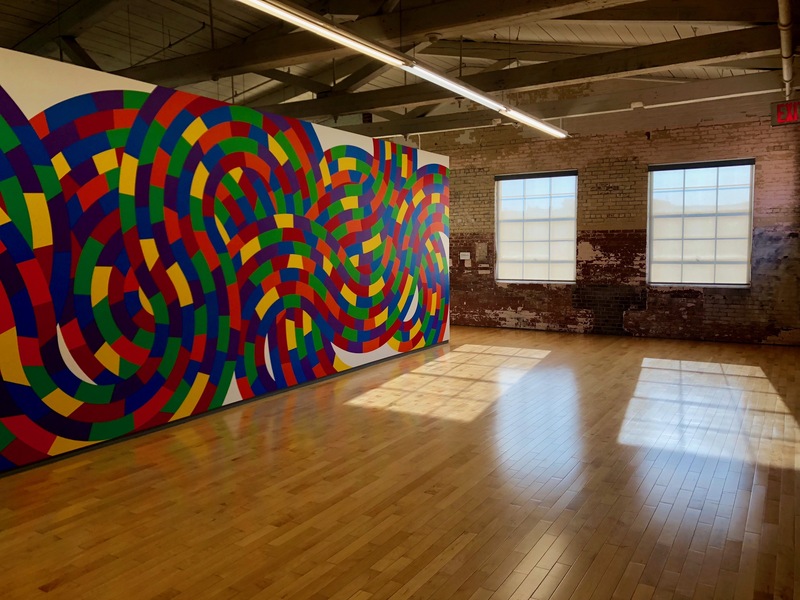 LeWitt was never one of my favs but this exhibit definitely made me smile. Pretty expensive, too. All his phases. They took the Gollies away, for obvious reasons. 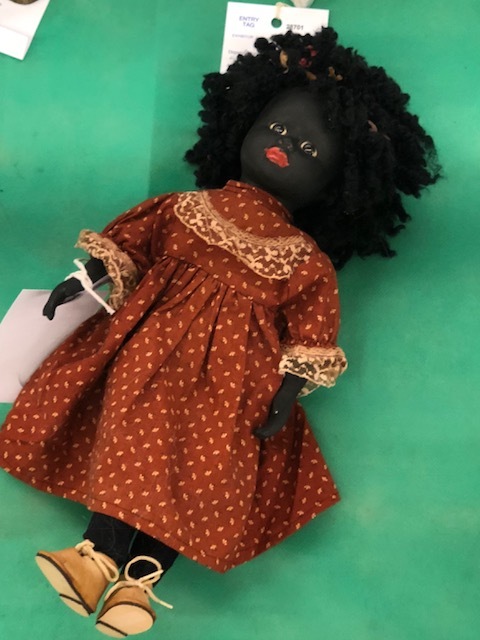 My Grandparents had a toy box that contained black dolls – exactly the same as white dolls, only black. I think they must have arrived via my uncle who was in the Navy. He brought many interesting things back from his travels. I remember really wanting a black or brown doll when I was a kid, but they didn’t seem to exist until my parents thought me too old for toys. My youngest sister got one, I think it was a Cindi (like Barbie but without the inflations). The art is fab, especially the light stuff and the pallets, and you’ve given me two new artists to explore! Did you grow up in a multiracial community? I’m wondering what put the notion in your head at such an early age to want a black or brown doll? It wouldn’t have occurred to me. It didn’t occur to my two younger sisters. Fascinating topic. Get to know James Turrell. He’s one of my favorite contemporary artists. He’s an LA guy and mainly work with light. There’s a crater out in Northern Arizona I hope to visit one day. We’re a multiracial family who lived in a very white working-class community, while our extended family were scattered about London and the south east. So I probably wanted a doll I could relate to. Thank you, I love that crater! While I’m in London (only another week and a half!) I’ll see if I can find any of his work in galleries. I can smell the barns at the fair from here… i hope you got an elephant ear!! i love those damn things… somewhere in the comments i chuckled at how the teenage daughter called her old man selfish for dragging her to the art museum when she could be hanging out with her boyfriend, stupid old man and his art, lol!! Truth isn’t truth, don’t forget it. I love the Berea Fair. That’s what it was when I was growing up. The Berea Fair. That Cuyahoga County stuff came along later in life. It’s exactly the same. T. Wolfe is wrong. You can go home again. I wonder if I’m ruining them for at by “forcing them to go to these exhibits. I suppose it’s possible but I’ll take my chances. My version of art is still the chalk art on the road outside my house… I can always find the time to look but never seem to muster the courage to add my two cents. 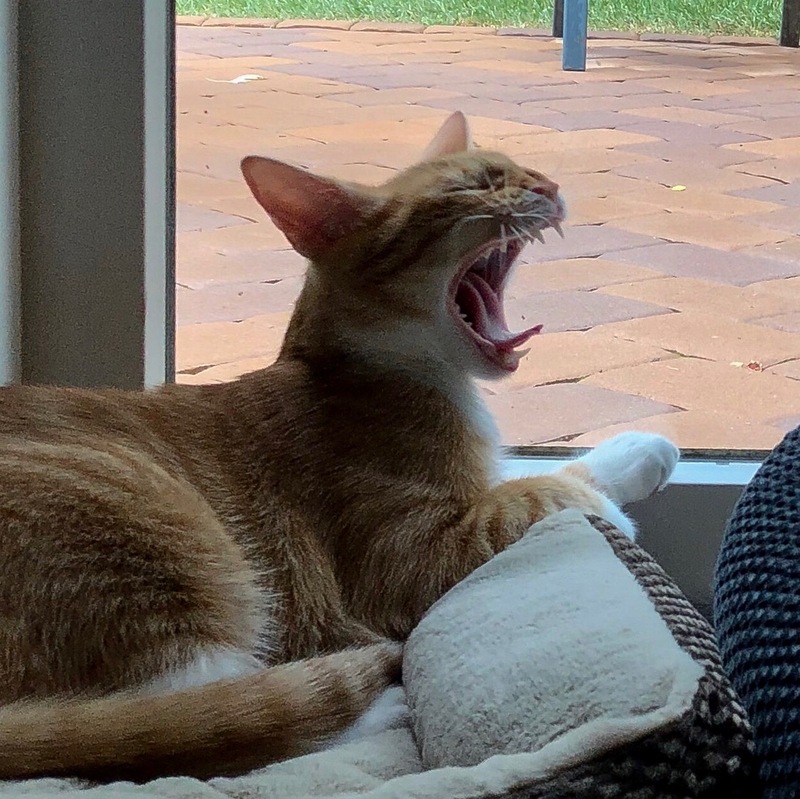 I hope you’re kidding about the fried gator… now, on to your more verbose post. I love the photos but I’m here for the words. Hello, Trent. Nice to see you. Hope you’re well and all that jazz. I wasn’t kidding about the fried gator. I look forward to it every summer. It doesn’t appear on the menu very often. Every picture tells a story. And it’s less laborious to produce. Question, could you pick out a bunch of records to put on in that one exhibit? I’m sure your daughters will be thankful some day that you took them places like that rather than letting them F with social media all day. Some day. I didn’t see this comment until just today! Way to be awake. The exhibit provided some albums but most of them were weird electronic sounds and nature sounds. They probably couldn’t pay the copyright fee to use actual music. Love the pics of contrasting urban/rural life! I have thoughts and queries immediately queuing up, such as… great work on convincing the girls to provide scale in the pics after their initial misgivings, they seem to have risen to the task with vim and vigour! 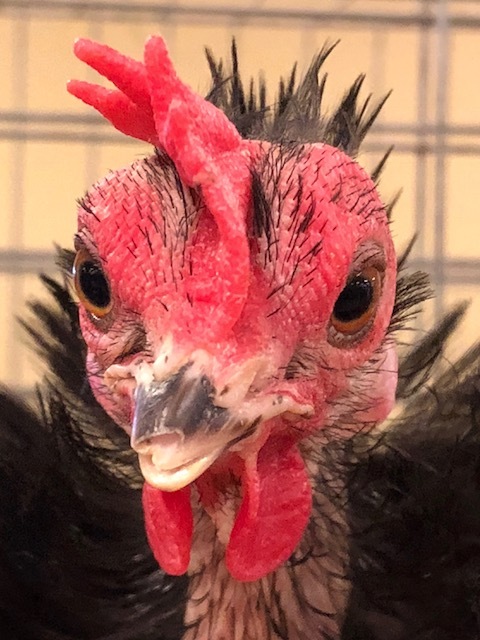 And… how on earth did you get the mystery hen/whatever it is to stay still for so long to get that close-up (not that it looks overly pleased to be captured for posterity, but still)? And.. hold on a minute, you telling me you actually have fried alligator at your country fairs over there? Hell over here we have to make do with a hot-dog, and if it comes with optional fried onions we think we’ve hit the jackpot. Bleedin’ hell! Hi! Hey, you’re new. Thanks for stopping in and taking the time to read and comment. I appreciate it. Those hens were in a cage! I just got the phone nice and close. If I panned back you’ll see the bars. Yes, we have so many alligators in this country that we can eat them. The meat is delicious. I wasn’t put off it all by the fact that it came from a swamp.